Pulley Equations: Pump Pulley diameter x Pump RPM = Manufacturer Pulley Diameter x Manufacturer RPM. Q: How fast do I turn my pump to give me a desired GPM? Q: What size pump pulley do I use to get a certain RPM? Fits Interpump, General and Admiral XLS, DDS Series Pumps, plus XD3040, XD3047, XD3055, and XD3065. V-Belt is the leader in the industry when it comes to its time-tested pulleys, sheaves, and bushings. Able to adapt to most pressure washer pumps, V-Belt will be your go to part, with its dependable construction and affordability. V-Belt pulleys are made from cast iron and are very effective and cost-efficient. Pulleys or sheaves are designed to mate with drive belts in many diverse power transmission applications. V-Belt pulleys are tailored for non-critical ratio drives. V-Belt bushing has cylindrical lining designed to reduce friction and wear inside a hole, or constrict and restrain motion of mechanical parts. Please us the example below to determine the correct bushing needed for your pump pulley. 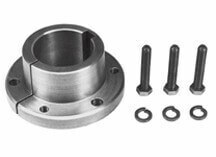 QD (Quick-Detach) bushings are used with hubs in sprockets and sheaves and other items to lock the part onto the shaft.